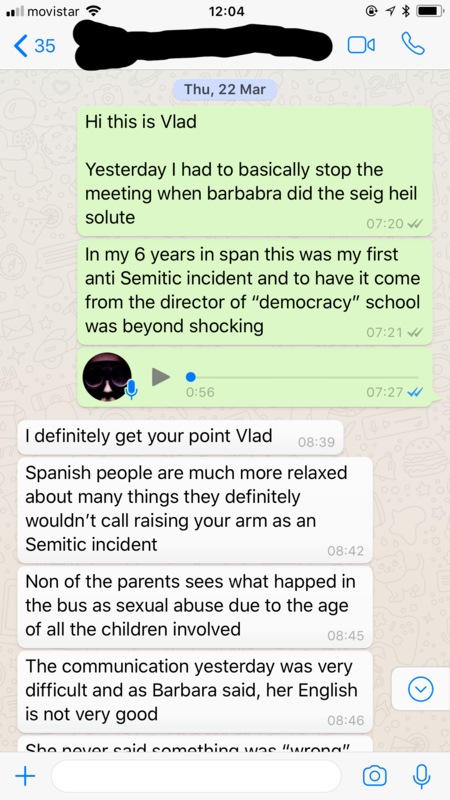 This is a continuation of the the “Adventures in El Dragon Democracy.” In the first part I told the story of how Barbara Serrano, director of El Dragon “Democratic” School in Madrid directed a few Nazi salutes at me in the middle of a parent teacher conference to debate whether what happened on the school bus constituted sexual abuse or a milder violation of consent. My article raised a number of other issues besides the incident in question. The article questioned the honesty of the Director who told us during this meeting that she interviewed people whom she had not interviewed, and it raised questions about the entire pedagogical and ethical model of the institution. One can often get a good sense about the ethics and true nature of an organization when it is observed at a time of crisis, and the release of parents’ stories did cause a legitimacy crisis for El Dragon International School. As Pedro and I spoke up, other parents started posting their experiences on facebook, google and other platforms that deal with alternative and international schools. Suddenly a carefully crafted PR image of the “First, Official Democratic School in Spain” was being threatened with the publicly exposed reality. The response was quite illuminating. Most institutions when faced with a PR crisis, (at least the smart ones) go into damage control mode. They try to address the concerns of their customers, and project an image of civility and desire to do the right thing and reform. Not El Dragon. They have decided to deny everything, and even use their staff to post denials for them online. They decided to threaten everyone who speaks out, even threatening lawsuits in their responses to facebook reviews, and now just a few days ago both my wife Nikky and I were summoned to court together with 4 other families on accusations of criminal defamation, and me and another person on accusations of making criminal threats. Our real “crime” is exposing certain aspects of El Dragon “Democratic” school. The aggressive attempts at silencing make the school seem anything but Democratic. El Dragon is trying to bring criminal charges against 6 individuals, in 5 families, for sharing stories of their experiences in dealings with the school as well as their personal opinions about those experiences. The way the legal process works in spain, is that a private entity like El Dragon can bring criminal charges against people, if they first file this act of conciliation and then there is a hearing where the accused can offer to pay them money to stop the process and agree to remove the articles they consider offensive. In this case El Dragon is trying to extract 520,000 eur from the 5 families. If defendants refuse, then El Dragon can go to a judge and ask for formal charges to be filed and case to start. The School made accusations of criminal defamation against everyone including Pedro and me for writing articles about what happened during our time at the school, and for sharing those articles on facebook. In the case of Pedro they are also trying to accuse him for filing a complaint with the USA based “accreditation” agency for El Dragon – NEASC. I am being accused of making criminal threats under the penal code for saying “wait until NEASC finds out about the Nazi salute Barbara Serrano did.” They also sued me for stating that I intend to work with other families who felt they were victimized by this institution to help them tell their stories – they are trying to criminalize journalism! 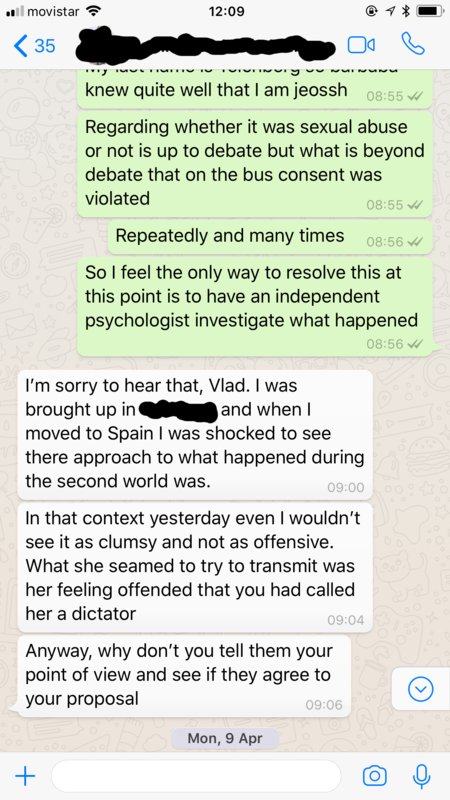 They are accusing my wife of criminal defamation for sharing her concerns about what is happening in the school in the whatsapp chat of parents and administration of the school, they sued another woman named Myriam for talking about her experience on facebook and leaving a bad facebook review. (They directly said they are going to sue her in their reply to her review)! They sued another person, Maria for filing a complaint with the Education Ministry which was actually substantiated, and for talking about it in her community and so on. To me this looks like a transparent attempt to scare other people from coming forward with their stories about the school. Who will say anything now that there is almost a 100% guarantee that you will be dragged into court on criminal charges? And it is also better not to share anything or like anything on facebook that the school might find objectionable, since you might get sued for that like some of the #ElDragon6 defendants. In the case of one defendant, you may be sued for sending personal messages and using published articles about the school to buttress your own personal belief that the school is corrupt – this resulted in a criminal accusations initiated by the school as well. The message is: “You better not even tell your friends about your concerns!” God forbid they may report you to Barbara and Juan who will sue and try to send you to jail! In my opinion, El Dragon is trying to criminalize people for saying negative things about them. They are trying to control both the public and even the private debate by threatening to put people in jail or at least the whole legal process for talking about the school publicly, or filing complaints with regulators or even just talking among friends. This is Democracy El Dragon style. Given the number of people being sued, It looks to me as if El Dragon is trying to export its brand of democracy outside its borders, and is launching a legal blitzkrieg aka operation Barbara-Rossa to stop the flow of negative stories as well as to shut down the people who are already speaking up. The irony that they are trying to use the State to police how people speak while calling themselves a democratic school should not be lost on anyone. NEASC has a complaint process regarding violations of these principles, which is not very transparent, and which remains unexplained since the NEASC has not responded to our questions. Apparently, it involves parents submitting complaints to NEASC, and then NEASC turning over those complaints to the school to ask for response. what exactly happens after that is not completly clear. What is very interesting is that at least 4 of the 6 accused people have recently filed complaints with the NEASC or were in the process of filing complaints. Apparently, the NEASC informed people like Pedro that their complaints will not be evaluated, as there is a rule that they not move forward until the school concludes any legal proceedings (which can be years by the way because of the appeals process). This lawsuit therefore also serves the purpose of indefinitely delaying investigations into violations of NEASC principles. Hence, we find that El Dragon operates in a black hole of regulation where the Ministry of Education will not investigate the school for ethical and possible safety violations since this falls within the jurisdiction of NEASC regulators. The NEASC meanwhile tables complaints indefinitely as the school sues any parent who dares to complain. And El Dragon is suing people en mass, adding 6 people at a time to new lawsuits to save on filing fees apparently. From my understanding the legal process takes anywhere from 2-4 years. In all of the charges that El Dragon has brought, there are very few factual allegations that would show what families have said to be false. In fact, reading through the lawsuit I only found one – namely that the school stated that I was mentioning non-existent nazi salutes. I.e. they are saying I am lying that this happened. El Dragon then accuses me of threatening to take this “lie” to NEASC. To me, this conversation establishes not only that Nazi salute happened in that meeting as opposed to what El Dragon claims in their court papers accusing me of crimes, but also this person who I was speaking with, who is by the way seems like a very nice person from the few times I have met them, felt empowered to defend a nazi salute first by saying ohh its just a “Spanish people are relaxed about many things” and then justifying it by alleging that I called Barbara a dictator in the meeting, which was also not exactly true, and it was rather Barbara who suddenly turned the conversation from discussing what happened on the school bus and what it means to suddenly alleging that I previously called her a dictator and launching into her diatribe which culminated with the infamous salute. I hope with the release of this whatsapp message we can move beyond debating whether Barbara saluted, and start talking about why Barbara saluted, and why the culture of El Dragon tolerated her salutes, and what that implies. And all of these nice people in that meeting – parents and teachers, 9 people besides me and my wife – witnessed what happened. At first they did nothing, then they trivialized it, and finally they have been working to help the school deny the fact that Barbara directed these Nazi salutes at me. We really must have a serious public debate about whether El Dragon is a democratic school, and whether the culture in El Dragon is consistent with basic democratic principles such as freedom of expression, mutual respect, honesty and integrity, and whether this kind of treatment of people; trying to shut them up and deny their fundamental rights of expression is acceptable of any school democratic or not. And we should also look into the NEASC and its accreditation process: is this institution possibly being used to legitimize schools that promote questionable ethics? Its very policies may incentivize schools to sue parents en mass in order to avoid inquiry into unethical behavior or substandard operations. The court where this trial will take place is about 10km away from the tomb of the late dictator Franco in one of the most right wing areas of Spain. It bears saying that the great democracy of El Dragon School is putting a jew on trial because its director did a Nazi salute to him and he dared to tell the world. 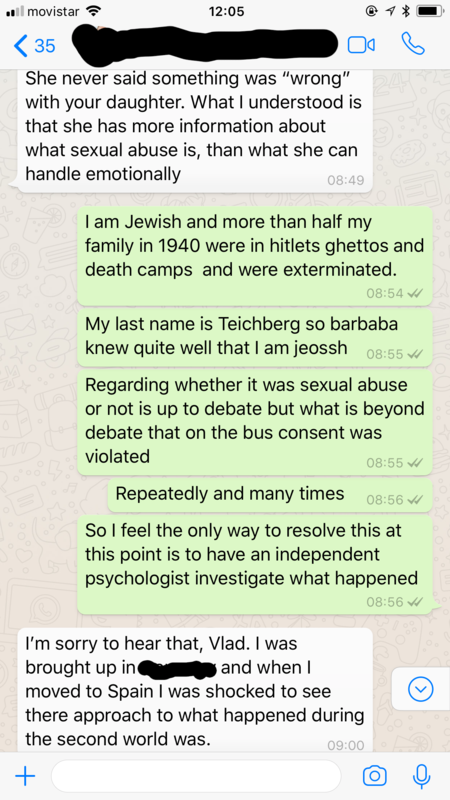 I am being put on trial for refusing to being a quiet jew who accepts this abuse. This “school” is trying to jail me for not keeping to my place. I have decided that when I go to court I will wear the same yellow star that jews were forced to wear as people around them Seig Heiled each other 70 years ago. I will wear the star proudly, re-appropriating this image of subjugation into an image of resistance against injustice and bigotry of all forms. We can not allow them to crush public discussion and debate – I call on all people to share my articles as well as narratives of other people detailing their experiences with these institutions. Demand that El Dragon International School get investigated. Demand that the NEASC get investigated: what if there are similar horror stories at other institutions accredited and protected by the NEASC? For the people who have been affected by El Dragon and are afraid to speak – I think we have a solution. A number of affected families got together in May and formed the association for victims of El Dragon. This organization, Afectados Por El Dragon will take testimonies from people and coordinate legal and regulatory complaints, assist people in getting their stories out (in a way that will shield them from this legal harassment) and also work towards healing the community by creating a neutral platform that enables people to speak about their experiences without fear of retaliation. There is a contact email on their website – get in touch if you are not speaking to one of the members already. All money raised from this fundraising campaign will go first towards covering legal expenses of ElDragon6, and then to facilitate the work of the Association of Afectactos Por El Dragon both in helping to defend against legal harassment towards those who choose to speak up, and to seek justice and healing for the victims of El Dragon School. The reason for setting up this fund is that many families El Dragon targets do not have the resources to defend against malicious defamation suits. El Dragon seeks tens of thousands of euros per case, and we estimate that the legal defense will cost 3000-4000 eur per charged individual. We do not want El Dragon to successfully bully families into staying quiet by filing frivolous suits.